Cardolite offers CNSL-based epoxy curing agents/hardeners and epoxy diluents and modifiers for two-component epoxy resins used in hand lay-up, vacuum assisted, and RTM processes. These products are offered individually or as part of the FormuLITE™ product line of fully formulated epoxy (part A) and amine hardeners (part B) that are ready-to-apply for the composite manufacturer’s convenience. Formulators looking for high bio-content, application-friendly, and high performance solutions can benefit from our offering. Cardolite phenalkamines’ portfolio includes a selection of curing agents that cover a wide range of viscosity and pot life requirements suitable for the majority of composite production processes. 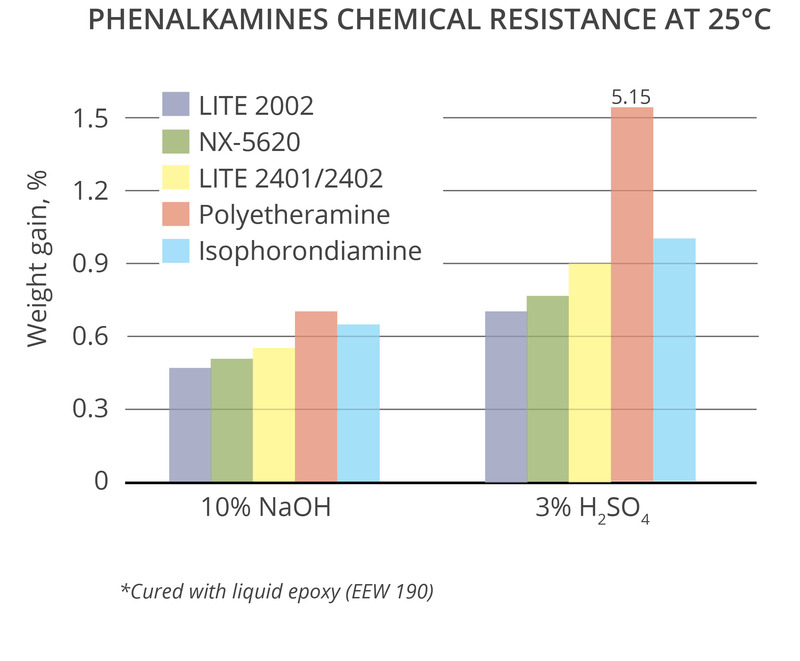 Good workability and formulation latitude, good reactivity at low and medium temperatures, excellent wetting of synthetic and natural fibers, medium and high glass transition temperatures, and non-critical mix ratios are inherent characteristics of phenalkamines. 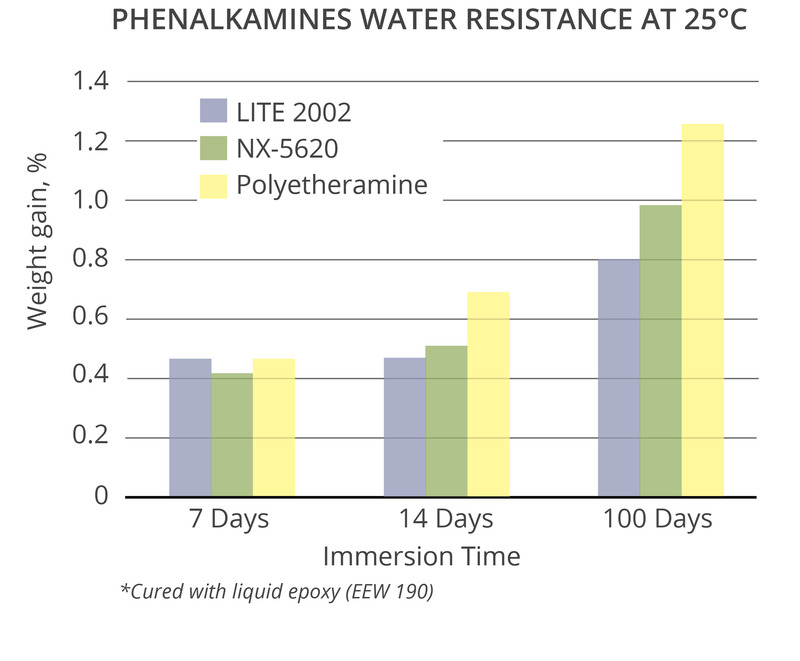 Whether your goal is saving time and energy during processing, achieving high performance, or maximizing bio-content, phenalkamines are the choice hardener, offering unique advantages in combination with standard or bio-based epoxies, epoxy novolacs and epoxy modifiers. Property table: Formulated with liquid epoxy resin (EEW 190). Cure schedule: hardening at RT + post cure 2hrs at 120°C (LITE 2403 hardened at 80°C and post-cured at 120/140°C). Cardolite epoxy diluents fully react with the epoxy-amine formulation and therefore, their impact on Tg is comparable to other industry standards such as C12-C14 monofunctional glycidyl ethers and ortho-cresyl glycidyl ethers. The versatility of NC-513 and Ultra LITE 513 allows users to formulate high bio-content systems with phenalkamine hardeners without sacrificing performance and workability. Moreover, epoxy resin modifier NC-514S offers increased flexibility, and water and chemical resistance while minimizing the effect on other properties. Cardolite epoxy curing agents, diluents and modifiers are very hydrophobic due to the long aliphatic side chain of the cardanol, which provides excellent water resistance. Cardanol derivatives absorb much less water than competitive technologies and in addition, their aromatic structure imparts significant resistance to acid and alkali attack. As a result, composite parts can withstand harsher environments and provide the desired durability to the end-user.